Nominal impedance is 4 ohm for WF168WA01 and 8 ohm for WF168WA02. Otherwise the two models are identical. 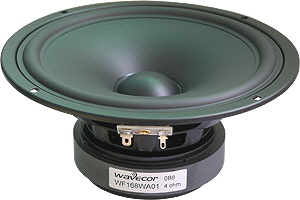 WF168WA01/02 are mid/woofers designed for demanding bass and midrange applications. It works equally well for high-end hi-fi, high quality home theater systems, and monitoring setups. Powered by a large 90 mm magnet structure that ensures good efficiency and optimal T/S parameters. 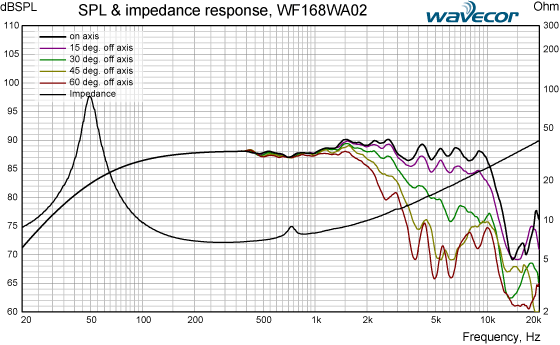 WF168WA01/02 are very good choices for medium sized 2- way speaker systems.